Our son loves trucks and when he has a choice about what we read to him he always goes for a truck book. Because of this, we have searched far and wide for the best truck/vehicle themed books. This is a list of our favorites. The Little Blue Truck is a delightful tale with great illustrations, a cute truck story, and a good moral lesson. It rhymes and was one of the first books that our son started finishing sentences in. The flagship book has lots of farm-animals for your young toddler to identify that the sequel does not. But, Little Blue Truck Leads the Way is still great fun. If you little one is really into these, the holiday editions (Christmas & Halloween) are not too shabby. Learning letters is more fun with trucks and Alphabet Trucks is the best attempt at giving each letter a truck, we have seen. There are some pretty obscure trucks (and obscure terms for normal trucks) in there and our Son gets confused sometimes. But, the rhyming is solid and the illustrations of this truck book are full of things for a toddler to talk about. 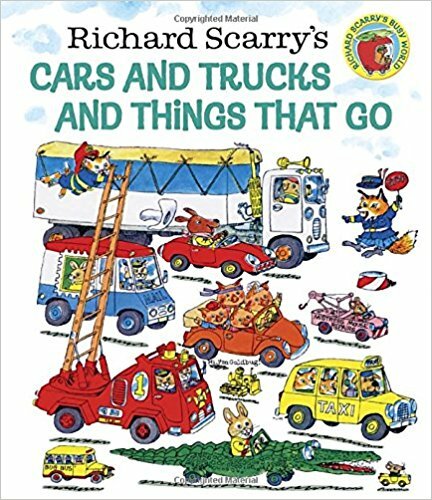 Richard Scarry’s Books have stood the test of time and now I know why. If you ask our toddler what book he wants read to him, it is a wasted question because “Trucks That Go” is the only answer. The book has a lot of things going for it. Each page is chalked full of things to ask questions about. There are characters that can be followed through the story. And, there is a hide-and-seek aspect that can be fun for both the parent and child. Some of the vehicles are fantastical and the book predates some of the more exciting vehicles of modernity (driver-less cars, segways, hoverboards, street-view cars, robotic garbage trucks, etc). But, those deficits can also be seen as features since your truck-obsessed child might learn the word “pickle” from the pickle truck and some of today’s most interesting “things that go” might not stand the test of time. Big Rig is a super fun book about semi truck. The illustrations of this truck book are chalked full of interesting details and text has some adventure without being scary. There is also tons of fun noises for you and your toddler to make at various parts of the story. The last page has a fun trucker-terminology glossary that we have never managed to get through because the page doesn’t include the expansive settings of the other pages and so prompts a “The End” or a “Read Again?” from our son. I think this monster truck book is intended to be seasonal (for Halloween), but I refuse to follow that guidance and read it about once a week. Mostly, this is because I have created silly-voices for each and every part of the story and so I have as much fun reading as my son does listening. But, I also think the story is pretty cute and am waiting for my son to fully grasp the sly ending. My only complaint is that part of the rhyming scheme is a bit unusual for a toddler-targeted book. You might want to read it through once or twice before jumping in with your toddler. Otherwise, you might stumble over a page or two. Our son gives hints when he is ready for sleep or a nap and one of those is quoting from this book. It’s a fun truck book to read with a good cadence and cute illustrations. There are some gotchas for the parent reader (places where the patterns break and places where the author substitutes her own words and/or employs language tricks). So, this is also one that the perfectionist-performing-parent might want to do a practice-run on. We picked this truck-book up at a fundraiser based on the cover-image and title. But, the cover image is actually the least impressive part of the book. The illustrations are pleasant and full of things for your toddler to name and/or ask about. The text is readable and flows nicely. And, the little boy and his father (who don’t even appear on the cover) are expressive and realistic. I also like how this truck book progresses through the seasons so there is some diversity in weather and the character’s attire. These are such great books! When my son was little he carried a truck book around with him! Need to grab few for my baby. Such a great list. Great list! We love “where do Diggers Eep at night”. I haven’t heard of many of these though, will have to check some out on our next library visit. Some of these are our favorites. We will have to check out the rest!